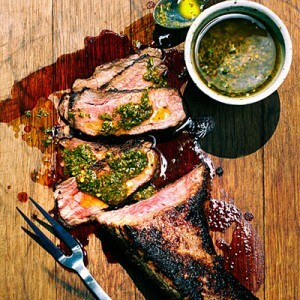 Recipe: Bison Tri-tip with Herb Chimichurri. From our friends at Sunset Magazine… a delicious preparation for BISON! Chef Jay Bentley of Open Range restaurant in Bozeman, Montana, sears bison or beef tri-tip on a hot griddle (plancha) over a grill and adds a spicy, herby chimichurri sauce. The recipe is adapted from one in Open Range authored by Jay Bentley and Patrick Dillon (Running Press, 2012). For tips on the technique, see Plancha Cooking 101, below. 1. Combine tri-tip with oil and seasonings in a 1-gal. resealable plastic bag. Chill about 24 hours. 2. Take bag from refrigerator about 1 hour before cooking. Meanwhile, set a cast-iron griddle or large cast-iron skillet on a grill and heat grill to high (450° to 550°). 3. Lay tri-tip on hot griddle. Cover grill and cook, turning once or twice, until meat is deep brown and an instant-read thermometer reaches 130° (medium-rare; don’t overcook), 15 to 20 minutes total. 4. Transfer tri-tip to a board, tent with foil, and let rest 10 minutes. Slice across the grain and serve with chimichurri. Chimichurri: In a food processor, pulse 2 tbsp. balsamic vinegar, 1/2 cup packed parsley sprigs, 7 garlic cloves, 1/3 cup packed fresh rosemary leaves, 2 tbsp. fresh oregano leaves, 1 tbsp. lemon juice, and 1 1/2 tsp. each red chile flakes and sea salt to coarsely chop. While pulsing, pour in 2/3 cup extra-virgin olive oil. Let sauce rest at least 1 hour; or chill up to 3 days, then bring to room temp. *Find bison at well-stocked butchers. WHAT: An Argentinean style of cooking on a hot griddle (plancha) over a grill. Chef Jay Bentley of Open Range in Bozeman, Montana, has cooked a la plancha for decades and gave us his tips. WHY: It quickly creates an even sear, for meat that’s crusty outside, juicy inside. Plus, drips of marinade stay on the plancha, rather than hitting the coals. Grill salmon, onions, and zucchini this way too. GET STARTED: Any cast-iron griddle or skillet will work; we like those by Lodge (lodgemfg.com). For more plancha recipes, see Open Range by Jay Bentley and Patrick Dillon (Running Press, 2012; $33). Note: Nutritional analysis is per serving with sauce.